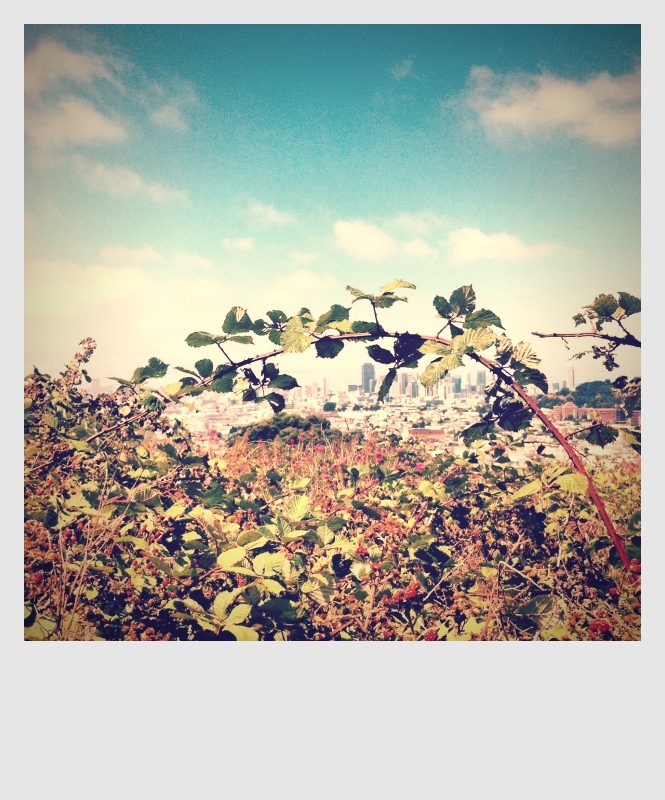 I went on a little city hike yesterday. Tuna sandwich, cherries, and guava juice. I huffed and heaved hoed my way up the hill and came upon bushes and bushes of thorny branches, filled with ripe and unripe berries galore. I grabbed a couple, climbed over some railings and foretold of a bloody fall. Backing away from the sloping hill I grabbed what I could. I continued up the hike to see more berries! Not now…I waited till I finished my hike before I succumbed to my greed. Berries…berries…berries! Some where not the sweetest nor were they the easiest to pluck. I put my sandwich bag to use, these downward facing hills wouldn’t detour me from dreams of making a city jam, but maybe the constant pricking of thorns might help. 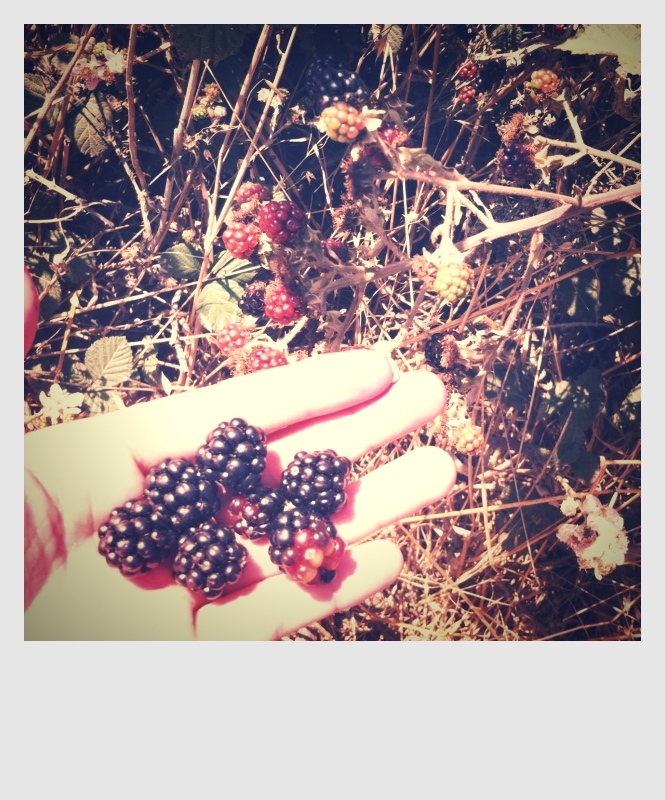 My jam fantasy came true, my city hike gave me a mini bounty of fragrant dark gems to bring home. I had just enough time to cook and jar them before I went off into the night. 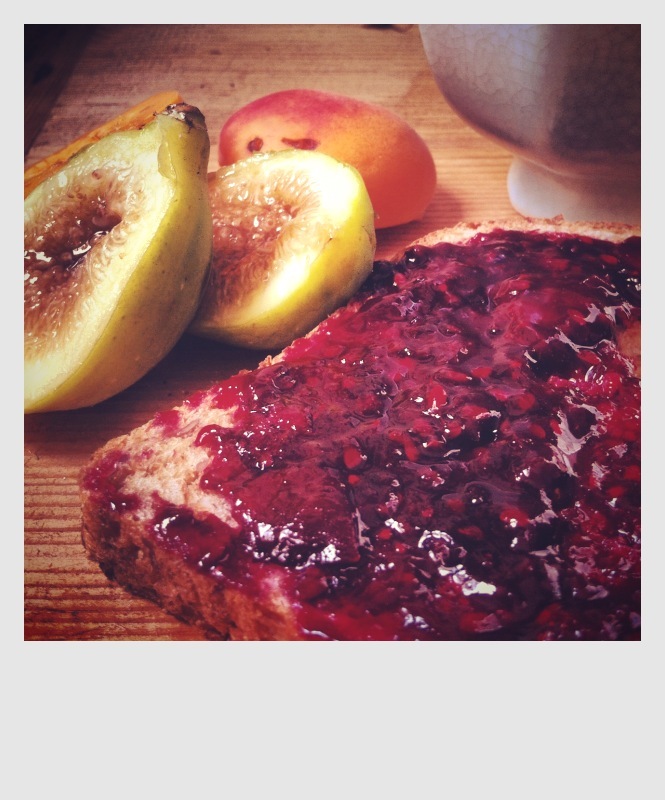 *I never add pectin into my jams. I add a little more sugar and leach out as much of the juices as I can then I reduce and reduce. The lemon always adds a nice brightness. The natural pectin from the pith as well as the acid always helps with thickening. Jams are not very complicated. Stir, watch it, and reduce it. For the home cook, nothing should be very complicated about making a jam. Just don’t burn it. A special copper pan would be nice, and a thermometer would be nice and that spoon test…forget about it all and just watch your jam like you would watch over a toddler in a kiddie pool. Rinse blackberries of dirt and debris. Cut whole lemon into thirds or quarters remove seeds. Place berries & lemon in pot, add sugar. Cook on medium heat. Stir to ensure that nothing sticks to the bottom of your pan. At this point you will see your berries shrivel and the majority of your pot will be taken over by the juices of the berry. This is a time to really watch your heat! Gently stir bottom of pan and sides. Turn heat to med-low, and just let this reduce to thicken. I recommend 20+min. Thicken it to about less than 1/2. If you insist on doing that spoon trick-stick a metal spoon into the freezer. Put some jam on the spoon and place back into the freezer, from here you can quickly see the gelling as well as desired thickness. Before placing into jars remove lemons and squeeze excess. Want it thicker? Cook it more-but be very mindful of not scorching your molten jam by stirring the bottom of the pan. Put into a clean sterilized jar eat and enjoy.